This side dish took its name from Hasselbacken, the restaurant in Stockholm from which they were first introduced. Considering the showy appearance of these accordion-shaped, golden spuds, preparation for the dish is really quite easy. And as with most tasks, it’s about having the right tools for the job. And in this case you’ll need a sharp knife and a pair of chopsticks or wooden utensils. The knife needs to be razor sharp so that you can easily cut thin slices in the potatoes, and the chopsticks help keep you from slicing through the entirety of the potatoes. The edges of these potatoes are like crispy french fries, while their centers remain soft and velvety, like mashed potatoes. 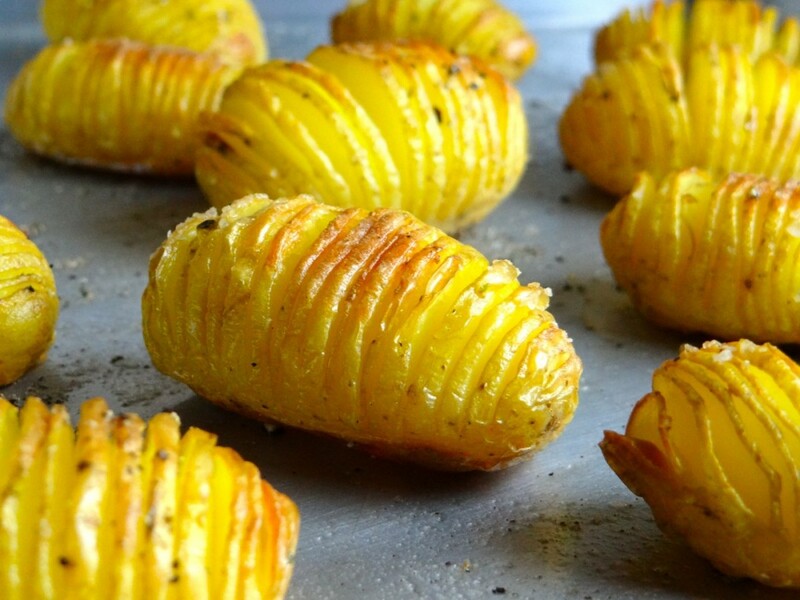 Consider them a fancier version of a baked potato. You can make these as a side dish or as an appetizer, if you use small enough potatoes. And you can season your potatoes anyhow you like. Some people go as far as to thinly slice garlic and sandwich the garlic slices between the slices of potato – a bit too much work for me. Alternatively, you can crown your spuds with whatever toppings blow your hair back; like sour cream & chives or bacon and cheddar. I find it best to use smaller-sized potatoes. Should you decide on using Russet potato or any other large variety or sized potato, you may want to consider an extra drizzling of oil half-way through the baking time, once the potato begins to fan open, to help with crisping. I would also raise the heat to start with and preheat the oven to 425° F. However, for this recipe I used small baking potatoes. They cook faster and the edges come out crisper without the add oil. The recipe below is not an exact recipe. I wrote it more so to share the method more than providing you an exact quantities to shop for. In the pre-packaged bag of potatoes that we had in our cupboard the potatoes ranged from tiny quail-egg sized potatoes to larger potatoes that were closer to the size of a door knob. I opted for the smaller potatoes, roughly the size of a ‘C’ battery. They not only come out crisper and quicker, but I think they make for a nicer presentation than the larger ones. Begin by placing your chopsticks or wooden utensils on both sides of the potato. Using a sharp knife slice along the potato, crosswise. Cut the slices about 3-4mm apart from one another. Use the chopsticks as a guide to assist you in not cutting all the way through. Place the sliced potatoes on a clean baking tray. Add the oil, salt and pepper and use your hands to cover and slather the oil and seasonings onto the potatoes. Next, place the potatoes sliced side up and bake in the middle rack of the oven for about 40-45 minutes, or until the edges are golden and crispy. Serve warm with your favorite toppings. Tip- Open the oven door for a few seconds after 20 minutes of baking to allow the steam to escape. This will help the edges to crisp. Question: could you show how the chopsticks are used to prevent slicing through the entire potato? Thanks!